CER T IFICAT ION, LICENSING & CEU — CAREER TECH TESTING — The Riverside and Peoria Campus locations offer testing and state exams. Please call (918) 828-5000 to be connected to the campus that corresponds to your testing requirements. 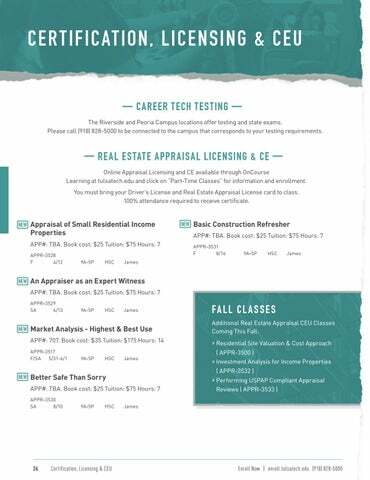 — RE AL ESTATE APPR AISAL LICENSING & CE — Online Appraisal Licensing and CE available through OnCourse Learning at tulsatech.edu and click on “Part-Time Classes” for information and enrollment. You must bring your Driver’s License and Real Estate Appraisal License card to class. 100% attendance required to receive certificate.